I’ve always loved eating nori rolls but traditional nori rolls use rice, which can elevate your insulin levels and put your body into fat making mode. But you can use a combination of cauliflower, almonds, tamari and lemon to make a sticky rice substitute that tastes great, without the hormonal problems that can lead to weight gain. Nori sheets are loading with trace minerals and make a great wrap. When you combine the cauliflower rice with veggies, avocados and a good protein source you’ve got a really great meal. 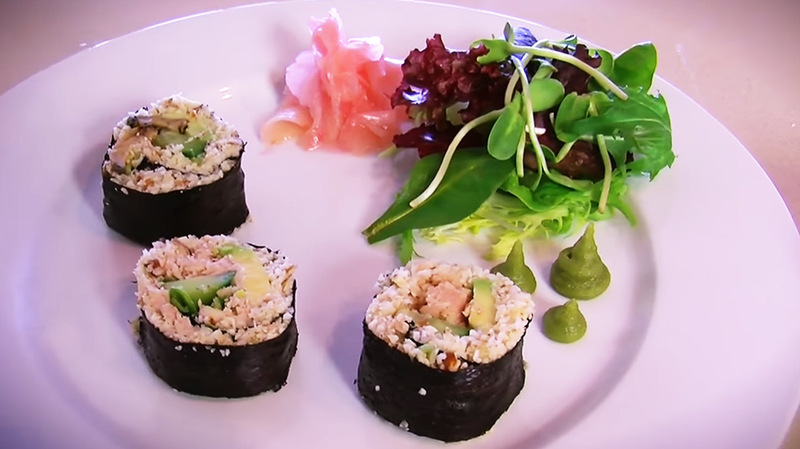 In this video you’ll see I made some with avocado, cucumber, sprouts and tuna and a vegan option that substituted tuna with tempeh. Tempeh is fermented soy and although soy isn’t normally good for you, when it’s fermented it can actually be quite good for you because it becomes a probiotic food that provides beneficial bacteria for your digestive system and is also high in Omega-3 fatty acids. But you can use any fillings you like. Pretty much anything you would put in a sandwich or wrap you can put in cauli-nori rolls. Once you’ve chosen your fillings you can serve them with a little wasabi and ginger ( try to chose a healthy variety that does not have any artificial flavors, colorings or preservatives) and a nice green salad. It’s a real simple recipe that anyone in your family can enjoy! 1. In a food processor, mix together cauliflower, almonds, tamari and lemon juice. Process until well combined. 2. Lay out nori sheets with the shiny side facing down. Place 1/4 cup of cauliflower mix onto the nori sheet. Spread it thinly, reaching to both sides of the sheet and about 2 3/4inches along the sheet. Place chosen toppings in a strip in the middle of the cauliflower mix, reaching to both sides of sheet. 3. Roll the nori sheet over the toppings until the entire sheet is rolled up. With dampened fingers, moisten the edge of nori sheet to help stick to itself. Cut roll into 6 even pieces. 4. Repeat with remaining nori sheets and toppings.